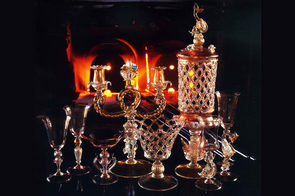 The master glassmaker Giuliano Ballarin was born in Murano on 15 March 1942 to a family whose glass art tradition has been handed down from generation to generation since the 15th century. 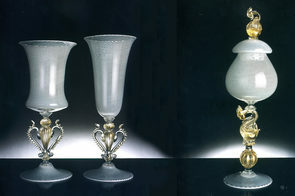 He approached the world of glass at a very early age, showing a marked capacity for learning supported by a sharp intelligence and lively curiosity, characteristics that, along with a remarkable artistic sensitivity, allowed him to rapidly assimilate the techniques and secrets of the best master glassmakers of the time, such as Carrara Albino, Martinuzzi Francesco and Carlo Tosi ‘Caramea’. 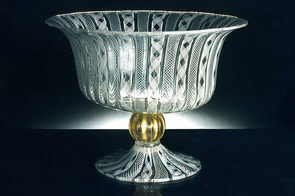 On achieving his artistic independence he opened his own glass works where, successfully combining new and old techniques and driven by the desire to constantly excel, he develops increasingly refined models and forms, attaining an artistic level that is admired by master glassmakers in Italy and around the world. 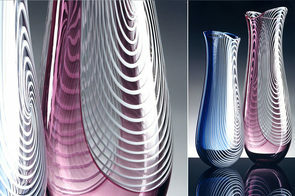 The master glassmaker Giuliano Ballarin exhibited his glass at the Venice Mart international exhibition in 1981. 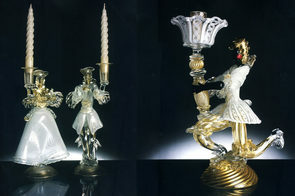 In 1982 he took part in the ‘San Nicola’ exhibition at the Murano Glass Museum. In 1984 he took part in the ‘Maestri Muranesi’ exhibition at the Palazzo Da Mula in Murano. In 1990 he took part in the ‘Opere in vetro’ exhibition at the Scuola Grande San Teodoro in Venice. He made the 1991/92 Val Badia Skiing World Cup. 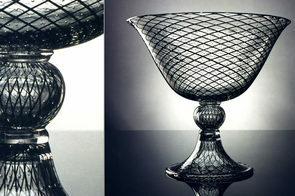 He showed his glass at the ‘Aperto Vetro’ Venice international exhibition at the Correr Museum in 1996. He made his debut on the international stage with a solo exhibition at the ‘Museum of Venetian Art’ in Otaru on the island of Hokkaido, Japan, in 1997, with the theme of ‘La tavola orientale e occidentale’. In 1997 and 1998 he took part in the ‘Disegna un vetro’ competition as artistic executor. He took part in the ‘Una cometa di vetro’ exhibition in 1999, which presented nativities by the master glassmakers of Murano. He made the ‘I Mori’ works shown by the artist Fred Wilson at the Venice Biennale in 2003. Tokyo 2011 KITAICY exhibition ‘La tavola veneziana’ Maker of the works by the artist Chisa Kotaki at the ‘GIìinza Mitsukoshi’ exhibition in 2012. Tokyo ‘Forme vetro Murano-Giapponesi’ 2013.